Since version 1.1, d2 runs in an OSGI environment. A d2 plugin is nothing more than an OSGI bundle. OSGI is a framework that enables service oriented platforms. It provides a number of infrastructure services (it takes care of bundle isolation, integrates bundle versionning, deals with security concerns, etc.) and allows to dynamically plug and unplug services (e.g. a MCDA computation service). [OSGI] provides more in-depth information about OSGI. You may find useful to use Eclipse’s Working Set feature to augment your workspace readibility (see Image below). Alternatively you may want to work against the binary bundles. For that you need to have already downloaded and unzipped the distribution. Open the “Import” wizard and select “Plug-in Development” > “Plugins and fragments” ; unselect “Target platform” and browse for the plugins directory under the d2 distribution folder. To facilitate the creation of a new plugin, an Eclipse plugin has been developed which integrates a new project wizard into Eclipse. To install this plugin, create a new Eclipse update site pointing to http://decision-deck.sourceforge.net/tools/ and install the 1.1 version of the starter kit plugin. You may need to restart Eclipse. The following assumes that you’ve checked out the d2 bundles from CVS. You may want to organize your workspace by enabling Working Sets and putting all d2 bundles (but the ones you’re working on - i.e. your d2 plugin) under a d2 Working Set. Once the plugin is installed, you can run the wizard. It consists of a single page, which asks the user for the new d2 plugin short name (e.g. Iris, Rubis, WeightedSum, etc.). Enter the name and press finish. A new project is created on your behalf, which is recognized by Eclipse as a PDE project (aka plugin project). The created plugin provides a complete working structure example, and covers the typical usecase, from the model layer to the ui layer. The next section will uncover the plugin internals. If you want to create a new bundle from scratch, you should use the “New > Plugin” wizard provided by Eclipse and create all the required elements manually. Persistence is achieved through Hibernate and mappings are declared through annotations only. The model layer exposes the entities which refine the global d2 model. The union of all the entities provided by the various plugins activated for a given project forms the model for that project. The entities composing the model layer are nothing but mere POJO augmented with JPA annotations [JPA]. We declare here that the POJO MyPersistentBean is a persitent entity (@Entity annotation) that maps to “MyPluginID_MyPersistentBean” table (@Table annotation). Its properties criterion (@ManyToOne annotation) and weight (@Column annotation) are persistent but not the foo attribute (@Transient annotation). Also we distingate between simple properties (of primitive type) which map to database primitives (Column) and relationships that map to database relations (ManyToOne, OneToMany, OneToOne and ManyToMany annotations). Please refer to [JPA] for more information. This will make your classes available to both org.decisiondeck.dao.core and org.decisiondeck.lib.hibernate bundles. As said before data access is achieved through Hibernate. Thus you don’t have to deal with JDBC directly (except for the most extreme cases), but you will rather converse with the database throughout Hibernate API. You need to create a DAO (Data Access Object) class that will encapsulate the calls to Hibernate. A generic dao which covers the selection, removal and update of entities, is provided by the org.decisiondeck.dao.core bundle. Two cases may arise : either your persistent bean depends on the project, or it doesn’t. In the first case your DAO should inherit from ProjectEntityDao, in the second case it should inherit from GenericDao. In both case, you just have to handle specific situations since all generic persistence scenarios are already dealt with in the superclass. You may want to read the Hibernate documentation [HIB] to learn more about the various ways to query the database. You will be notified of any persistent changes of instances of MyPersistentBean (and only instances of that class). The parameter event passed to handleEntityEvent allows to know which entities have changed and the type of the event triggered. 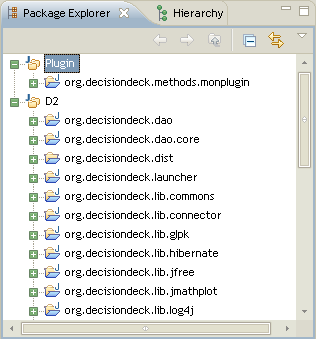 In the manifest file, add org.decisiondeck.view (eventually org.decisiondeck.view.core as well) to be able to access the core classes. The registered class must implement org.decisiondeck.view.navigation.INavigationMenuItem interface. you may want to inherit from the abstract class org.decisiondeck.view.navigation.AbstractNavigationMenuItem. Open the “Run dialog”. 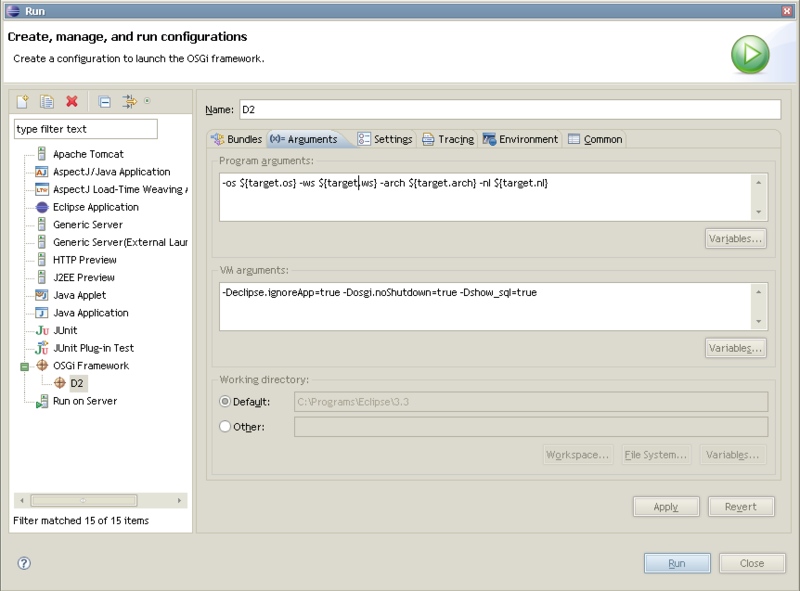 Create a new “OSGI Framework” configuration, call, f.i., d2. In the “Bundle” tab, check the “Workspace” plugins checkbox and uncheck the “Target platform” checkbox. Then click the “Add required bundles”. To test the artifact, just drop the created file into your decision-deck plugins folder (restart decisiondekc if necessary).